I cry out….. I cry out regarding Neo-conservatives and the Pro-Israeli lobbies’ apparent warlike approach to Iran. I understand and agree that nuclear weapons should not proliferate. However, we seem to have not learned a lot from our virtually 10 year experiences in Iraq and Afghanistan, wars that have cost Ca. $4 Trillion according to a Brown University report, http://costsofwar.org/, to date, with additional costs accruing and interest yet to be paid on our borrowed money. How much is a 1 Trillion dollars? It is a stack of $1,000 bills stacked 67.9 miles high, or from Tuscaloosa to the other side of Birmingham if we were to drive by the stack laying down on the road. Or 4 Trillion is a stack, not end to end, but a stack laid flat together to go as far as from Tuscaloosa to Nashville, plus 30 miles more. These are merely dollar costs, to say nothing yet of moral costs, of loss of lives, both our own and our “enemies”, the mental costs to our soldiers and our enemies, the medical costs for now and the future, as well as other costs. A costly lesson, these wars, one might imagine. It is also hard to imagine we seemed doomed to try it again in Iran, knowing it did not work the first time, without giving Peace a chance. Let us please give Peace and Nonviolence a chance….. The majority opinion of governments of the world and religions of the world is that Nonviolent methods of conflict resolution will not “work”. I feel it is unfair to speak like this, saying nonviolence will not work, without investing in Peace and Nonviolence in at least an equal way we invest in War. We have invested Trillions of Dollars in war. War must be paid for, not only in the blood of our soldiers, but the blood of our perceived enemies, and in the future welfare of our young who are to be saddled with our folly. Before we dismiss Peace out of hand, because “Peace just doesn’t work”, let us invest in Peace, just a portion of the Ca. 4 Trillion dollars we have invested in war. Perhaps just a Billion or so to begin with, which is just 1,000th of a $Trillion stack, just for starters….. Do we not know by now, that “War does not work”? The investments we have made in war are clearly failures. Before “Iraqing” Iran, let us commit to spending 10% of our war budget investing in Peace. Let us invest in teaching methods of Peace and Nonviolence in the world’s educational, civic, political and religious infrastructures. Let us talk about Peace, and dialogue about Peace and Nonviolence. Let us invest our time, financial resources, and prayers for Peace and Peaceful purposes, praying for our enemies, as well as our friends. Let us preach about Peace in churches, in prisons, and schools. Let us reject Hate and War, learning to be and actually becoming Peacemakers. Let us put our money where our heart is, if our heart is at Peace, and in Peace. I am personally doing this myself, and plan, if approved, to invest some of our remaining funds to go with The Fellowship of Reconciliation, http://forusa.org/, on a Peace Delegation to Iran in the first two weeks of May. 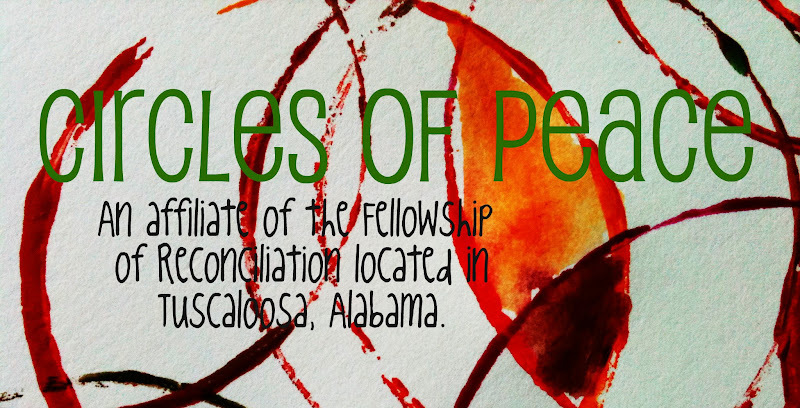 The prayers and support of all faith based organizations in Tuscaloosa for this Peace Delegation will be appreciated. Let us all cry out! Investing in Peace and Nonviolence is about the future of our nation, and of our world, of beautiful human beings both here, in Iran, and all over the world who will be affected by our decisions regarding our future investments. Will our investments grow and bear fruit, or decay, and rot away?